We feature fine guitar brands like Ibanez, Washburn, and Samick. Whether you're looking for acoustic, electric, bass, jazz hollow body guitars, accessories or guitar packages, Mike's Brass & Woodwind offers a selection for professionals and novices alike. 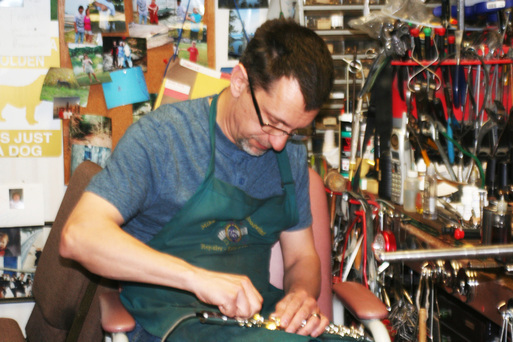 A degreed musician himself of VanderCook College of music, Mike has been serving northwest Chicagoland with instruments, lessons, and repairs since 1984. We carry Conn/Selmer, Gemeinhardt, Armstrong,Bliss, Holton, King. He brings the same level of personal care and service to his online store and Amazon. Not a guitarist? Mike also provides lessons on all band instruments, piano and voice. We do instrument rentals starting at $27.00 per month. All lessons are given by degreed musicians and are $22.00 per half hour. Come in and check us out. Thanks, God Bless.